...who's up for a giveaway to start the year? Yay! One for me and for my bestfriends too! 3. Comment on this blog post your name, google friend connect alias, and contact email. And fill this in: "I love my bestfriends because ___________." Deadline of entries will be on January 21, before 12 midnight. Make your answers fun and unique! 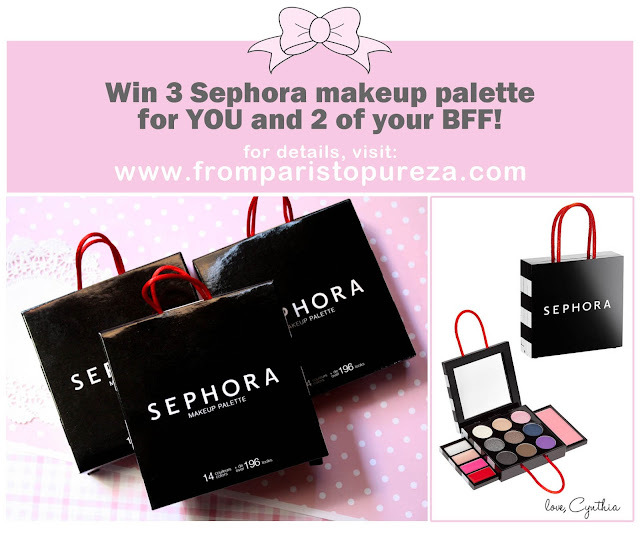 I will be choosing the winner with the best answer to get all these 3 Sephora palette and will be announced on Facebook the following day! Keep yourself updated, check out my Facebook page and this blog from time to time, and follow me on Instagram too! Good luck lovely dreamers! Here's for a pretty 2013!